Every time I go to The Rosemary House and/or Sweet Remembrances Tea Room, I am struck with the many numbers of delights found in the shop, gardens, and dining area of the tea room. Besides all of the wonderful things to purchase or taste, just looking around is an enriching, soothing experience. Let me explain something.... I rarely travel alone. My sense of direction is nil, and that means that until now I've done everything possible to avoid it. Yes, I've been mocked... but that doesn't hold the same sting as driving around aimlessly in the dark with a sense of dread and panic building. As it turns out, I am also pathetic at scheduling, and managed to schedule two off-site soapmaking classes at precisely the same time in two different counties - which meant that the Twisted Sisters went our separate ways last night. And I purchased a GPS. Whoo BABY! Still, I arrived very early and slightly rattled. Sampling a bit of Susanna's violet libation was a nice touch.... But that little device just may have changed my life. Pots at the ready, waiting for the next gardening adventure. The Peace Garden, a nook dedicated to Bertha Reppert, founder of The Rosemary House, and beloved matriarch of the family. Lunaria growing next to witch hazel. A tree filled with teapots. One section of the wall in Sweet Remembrances. The "Tea for the Tillerman" album cover caught my eye, as I've been singing lots of Cat Stevens songs to myself lately. Can you find it? And really, I just scratched the surface. There is a large bayberry, a big fig tree, a beautiful fairy garden, a koi pond, and literally 100's of plantings - along with a small greenhouse and a plant sales area. The barn front is covered with a collection of birdhouses, and a wringer washer is filled with jewelweed. A bathtub is starting to bloom. You really, really have to visit. It's beautiful. 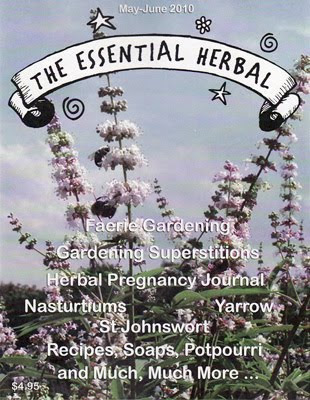 Today we hit the very beginning of the PA Herb Festival in York. It is going on tomorrow, and if you have some time, run on over and check it out. We were pleasantly surprised. It has been a long time since we've seen so many new and interesting vendors at a festival - that didn't include home parties and window replacements. There were a few soap companies, but not many, many companies like before (we always notice that - what can I say?). The fact is that we always have a great time because we see our friends, but it was good to see some new stuff. So here's the mini tour. I forgot lots of people, especially Barb from Alloway, and the folks from Willow Pond... but there will be other opportunities. Sharon Magee is in her 25th year with her herbal pottery. Snap it up, folks. You just never know how long somebody will keep making something. We'll be hanging with Sharon a few days in the coming week during another conference. You'll probably hear more there. Sarah was settling in to her booth space representing Radiance and Herbs from the Labyrinth. It looked pretty homey, and Kara had headed back to Lancaster to pick up some additional items. There were some recently dyed silk pieces on the aisle, and the market baskets appeared to be flying out of there too. I doubt if she got to sit and relax too much today. Jason Spring from Spring Thyme Nursery in Dillsburg was doing a great business with his nice big herbs. In years past, it hasn't always been easy to have the herbs ready for this show, but not this time. There was lush patchouli, and the signage at his booth was imaginative. The Japanese Jack-in-the-pulpit at the Charles Racine Co out of Elkton MD just took my breath away. Worth every cent of the $38 price - if it weren't for the fact that our deer would make a beeline for that plant. Hepatica, a wide variety of Trillium, Woodland Poppies, and Bluebells were all tempting - very tempting. This booth also usually has a splendid array of hostas. As the doors opened this morning, the crowd began wandering, and many of them went directly into Barb Steele's talk on Dill - the herb of the year for 2010. We wandered around and saw these trivets made from lucite enclosed herbs and botanicals, stained glass outside lamps, mosaics, stoneware, chimes, soy candles, and a good many teas, dips, botanicals, jewelry, and bath and body care items. Maryanne chatted with Dee Shartles of Downhome Herbals. I think this is Dee's first year at the festival, but I'm not certain because we don't normally get a lot of time to go visiting. Anyhow, she has some lovely stuff. Debbi Quinn from Blue Moon Herbals was one of the first people I saw upon entering, and her warm smile and happy voice just drew me right in. Besides having some of the most beautiful curly hair on the planet, Debbi has conjured up some incredible perfumes that are named for different deities. She's an advertiser in the magazine, so you'll see her link on the sidebar (as is Sarah). Chef Tim had his tasty balsamic vinaigrette on sale, and the samples were delish. I still have a good bit on hand here at the house. There seemed to be a good bit of sampling going on. Lots to see and do, smell and taste. Finally, as we were nearing the end of our circuit, we noticed that Susanna of The Rosemary House was doing a demo - and leaving her booth unattended. So we decided that we'd go play behind her booth while she was away. Now that was absolutely perfect! We spent about 30 minutes behind a table joking around with customers. It was fun. When Susanna came back, we sampled some of the cordials and concoctions she brought along for a workshop she was doing later (and will repeat at 2:15 tomorrow). As we drove off to make another soap delivery in another part of the county, we agreed that we'd made the right decision to limit our shows this year. It was really great to see people - and we'll see most of them again over the next few weeks - but it was truly wonderful to be able to leave. The other day I mentioned that there were figlets on my little tree. Now this is only the second spring for this brown turkey fig, so I wasn't sure if it was early. I *do* remember that last year I was sure it had died - until noticing that it was sending up new growth from the ground. These leaves and figs are growing from last year's growth. The chives are something that I've grown for years. They typically are blooming over Mother's Day - which is 3 weeks away. Ahem. The currents, which are blooming for the first time this year (aren't they sweet???) are already setting fruit. So are the gooseberries, but not quite as fiercely. Not enough to convince you? Okay then... how about elderberry buds? Huh? How about THAT? That's right. One of my elderberries is already budding. It is an early variety, but come on - it's the middle of APRIL. Just for kicks I snapped a shot of wild heartsease that grows everywhere in the fields and gardens and yards here. I'd never seen it growing wild until landing here, they are about 1/2 the size of violets. They really do lift your heart. Next up, one of the three Concolor firs in the back yard has candles. That's the term for new growth on evergreen trees. A friend across the country sent me some special tree buds from her part of the world and she and I have been plotting what we would do with these when they were ready. I'll be popping some in the mail tomorrow. In the meantime, I started a little oil. I can't capture the happy chartreuse, but it is probably the prettiest infusion I've ever seen. So now I'm wondering how this summer is going to go. Does this mean I'll have a great fig harvest? All kinds of fruit that struggles to ripen in this area will do ok? Or will we have frost and it will be moot? These are the things that make life interesting, eh? If every year on the exact same date we would have the exact same temperature... or if it was always clear what to do to remain safe... yawn! Take 10 minutes to rejuvenate your face and your spirits. Instructions and suggested herbs for 5 skin types. Traditional medicine of the islands and how disease is viewed in the Caribbean. How one woman teaches a potpourri class in a busy faire setting. Herbalize your kitchen with these tried and true recipes. Ever want to enter your specialties in a state fair? Here are some ideas to help the process along. For the love of our crowning glory, from time gone by. Scarecrows and gnomes and weathersticks, oh my! Gemini brings special herbs and a potpourri. One woman's search for a remedy for severe lower back pain -- and beyond. There are many things to do with these gems of the garden. Several recipes are included as well as information. Just what are fairies, and how can we welcome them to our gardens? "Useful for so many things, easy to grow and beautiful to boot, what’s not to love?" Learn why SJW has been considered a mystical, magical plant with amazing healing properties for centuries. 5 amazingly decadent recipes made from one pound of oils. Prevent aging, build strong bones and teeth, prevent colic and good for the skin? Drink up! What are antioxidents, and why should we seek them out? Luscious soap filled with fresh ginger, clear instructions ... Mmmmm! Quick "tips" for this fleeting veggie. It may seem that I am playing hookey a lot lately. It feels that way, and in between the mail prep, the work on the balm recipe book, and the everyday yard work and laundry - YES! Spring calls. For various reasons, the past few springs have slipped through my fingers, and this one will not get away without being fully enjoyed. Within a few weeks, the forest floor will revert to hiding beneath the brambles and the poke weed and all the multiflora rose bushes. It is a very brief period of time that we can enjoy the springtime jewels laid before us, and so eventually I will go back to writing about what you can do with herbs - but for now, it is all about enjoying the spring. The paths through the woods are breathtaking in their brilliant jade and chartreuse shades. As we walk, the birds sing, and blue jays and cardinals call out, along with the chickadees, starlings, blackbirds, and mockingbirds. Doves scatter as we approach, and woodpeckers are busy drumming on hollow logs, looking for insects. Walking along it feels as if life itself is pulsating all around us so much that we are also rejuvenated. The jewelweed is so rampant that it clings to anything that stands out above the water level in the creek, sprouting right there. In summer, it will grow right up in the center of the stream. The Jack-in-the-pulpit stands tall and proud, with his hood barely dipping. A trout lily stands guard to the right. Most of ours here is deeply striped with burgandy, especially the stalks - but not all of it. It is a beautiful plant. The various trilliums that we've transplanted are just beginning to bloom, while the ones we visited the other day were starting to fade. The red ones we planted across the creek haven't started to open yet. The variegated solomon's seal has unfurled his leaves, but has yet to bloom. I love to see the drooping creamy drops along the stems. 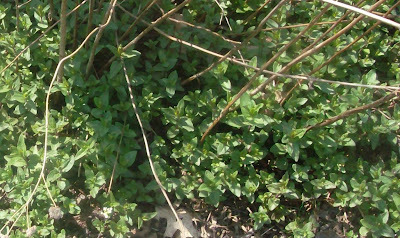 We also have fields of false solomon's seal, and they will bloom with creamy tufts soon. The dogwoods are out in force, beautiful against the sunlight. As we leave the woods we walk very slowly, dawdling by the pond, trying to stay just a little bit longer. Spring is such a gift. Ramps, Wild Leeks, Allium tricoccum... whatever you choose to call them, they are up here in PA. I hadn't ever heard of them until sometime in the late 90's David Winston gave a workshop at The Rosemary House in Mechanicsburg. He probably spent a good 30 minutes of a day long workshop on ramps, so it had us thinking they were worth seeking out. Ramps are in the lily family, closely related to onions, garlic, wild onions and garlic, and shallots and leeks. They are enormously health-giving when eaten regularly, as are the others. Ramps are very pungent, and take a few days to move through your system. Some people will exude the "fragrance" through the pores of their skin for some time. However, given the antiseptic, and antiviral properties as well as the benefits to blood pressure and the respiratory system... well, who cares? There are festivals around the country where the ramp is celebrated. Recipes compete and the celebrants eat their fill. 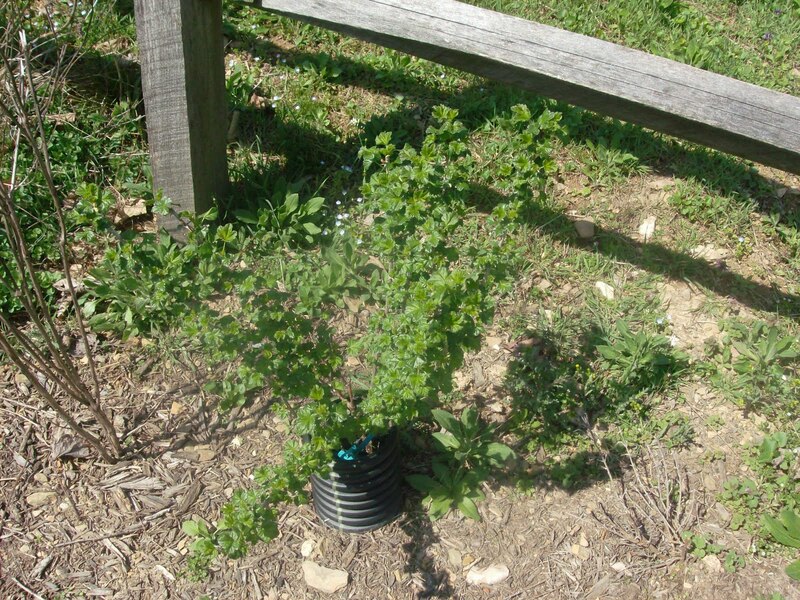 The picture above is one of the little patches we transplanted from Fred Will in Somerset a few years ago. They've taken very well and all of the patches are spreading. Wild Foods for Every Table - available on The Essential Herbal website. Check it out! We're going to have another little show and tell - not so much because there is so much to tell, but because the weather has been astounding and everything is going crazy at one time. WAY early. Some of the things we're seeing are 4 or 5 weeks early. I'm very proud to show off my blooming currants. First year blooms and there is so much out there for the bunnies and groundhogs to munch on, that they're leaving my fruit bushes alone! Yay - I may see some fruit this year. Today we went to the Shenk's Ferry Wildflower Preserve. I wrote about it several years ago. At that time, the various corydalis flowers like squirrel corn, white bleeding heart (oxymoron? ), and dutchman's breeches had already pretty much finished up, and the things like phlox and wild geranium hadn't started yet. HAH! Because of this bizarre weather, EVERYTHING is blooming at one time! There are, quite literally fields of Virginia bluebells and white trillium. My camera wouldn't cooperate, and missed the blues of the phlox and geranium. The wild ginger was everywhere, blooming it's heart out, and there were even a few white trout lilies - which I've never seen before. The saxifrage was too small, and the Jack in the pulpit just didn't come out. The blue cohosh was abundant, and just getting ready to bloom. You can see some spring beauty or maybe toothwort in the background - both were all over. Afterwards we went to a little restaurant in Millersville called The Barn Door. We were famished from the walk and the food was delicious. Our server was delightful. When I was a little kid, every single April Fool's Day my mom would wait eagerly for us to get out of bed so that she could tell us that it was snowing. We'd race to the window to see if maybe we'd be getting out of school, only to hear Mom laughing behind us. She loved it. Another of her favorites was to offer to tell us a "dirty joke" and if we took her up on it, she'd say, "a pig fell in a mud puddle!" and laugh her head off. Sometimes her goofy sense of humor is reflected in all of her children, but she was individual who took pleasure in the smallest things.As we grew up, we would all call each other on April Fool's Day and try the snow joke out. I rarely missed a chance to tell Mom it was snowing on that day. Oddly, since she died 5 years ago, it actually has snowed twice on April 1st. Last year was one of them. Yesterday was 80 degrees. The yard has gone insane, and is in serious need of a good mowing (fortunately the kid is on her way home from college right now - heh heh), and I've already spent more time working in the gardens this month than I usually spend in the whole month of April. 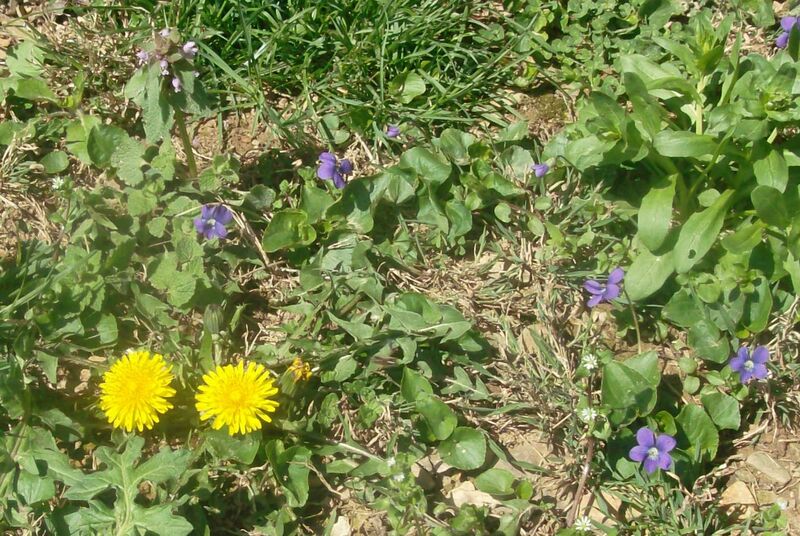 First there are the violets and the dandelions. It was the end of April last year when I was making violet syrup. 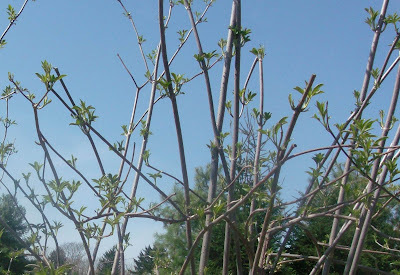 The gooseberry bush is covered with leaves, and it looks like this year there will be berries! The mountain mint is working very hard to take over a section of the yard. I can't believe how it has gone from that tiny slip in my suitcase from Baton Rouge, to this huge patch in just a couple of years. 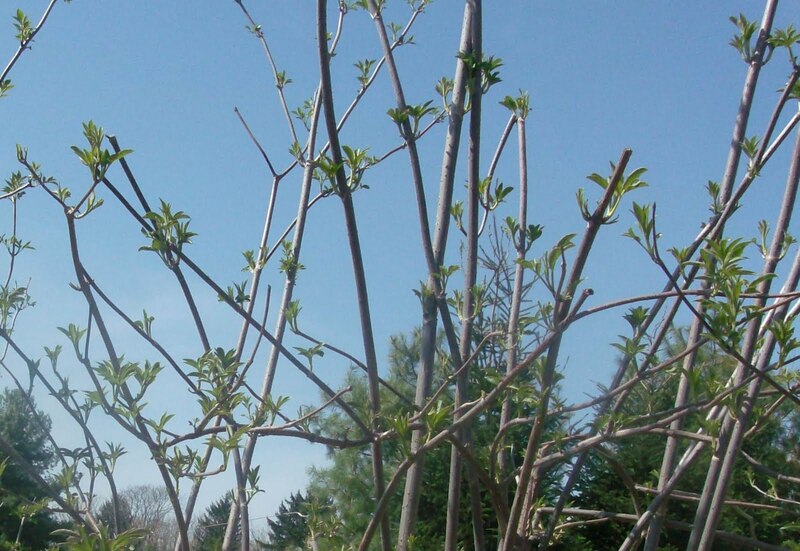 The elderberry bushes are leafing out beautifully. They are so healthy and vibrant. 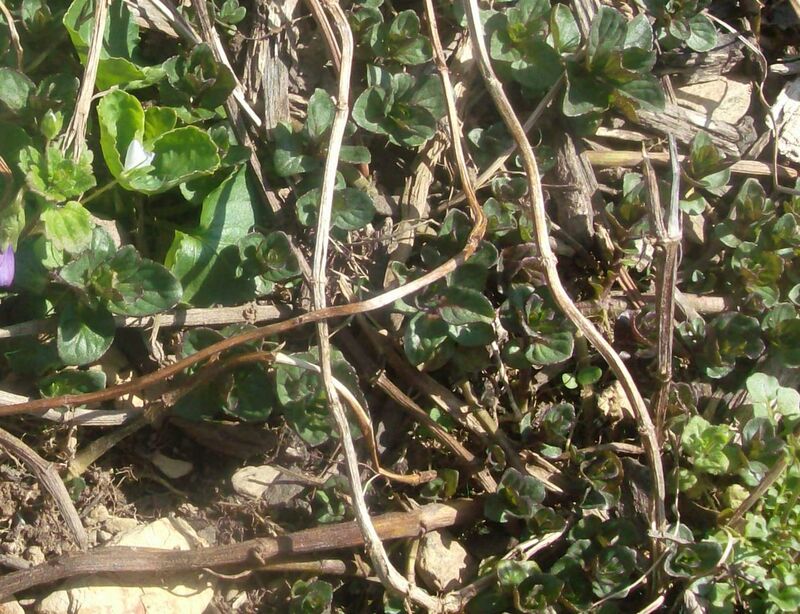 And the chocolate mint is popping up in its home beside the chamomile, and it won't be long before I'm out there picking it to dry for the winter, or filling the still with the fragrant leaves. 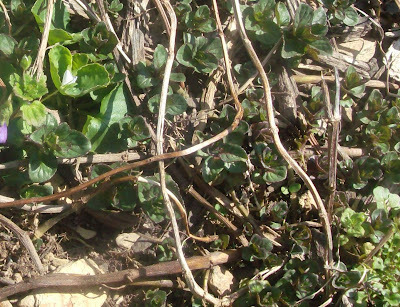 We don't even want to discuss the chickweed, ground ivy, penny cress, and red dead nettle that are growing at astounding rates.